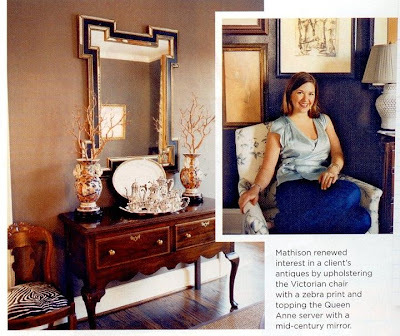 Atlanta is buzzing right now with the news that one of our own, designer and Peak of Chic reader Mallory Mathison, has been named one of this year's "Domino 10". This is the first time an Atlanta designer has been named one to watch by Domino. Congratulations Mallory! 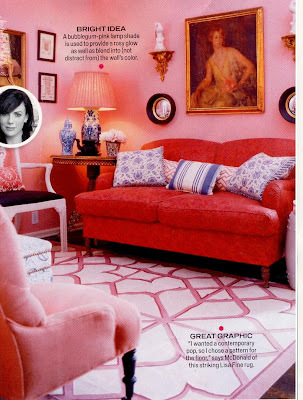 Did you see this fabulous pink and white Lisa Fine rug in the new issue of InStyle magazine (in none other than a Mary McDonald designed room)? I got the chance to see Fine's rugs at Nathan Turner, and let me tell you they are gorgeous!!! Very fresh and vibrant. Contact Nathan Turner for more information. Want a sneak peek at what designers Matthew White and Frank Webb have up their sleeves for their room at this year's Kips Bay Show House? Why then visit the World White Webb for this morsel as well as tips on Spring flowers, displaying objects, and architectural models. Avery Noll is having a big Spring Clearance sale. 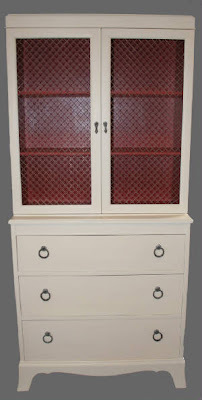 Check out their site for further information, including details on this cabinet above. Regarding Avery Noll...we all know who bought the faux bamboo bar cart, don't we? Oh I am soooo looking at that cabinet and they're only 40 miles from me! We need to see pix of your barcart - with lots of fun drinks on top! I was so excited to see Domino's top 10 and Mallory sure has great style!! 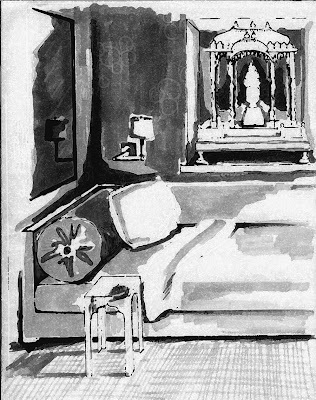 Sir Philip Sassoon's room is breathtaking and exquisite. I've never seen a picture of it so I'm delighted you found it. Your blog is wonderful. I'll have to pick up a copy of InStyle -- thanks for the tip! what great facts, thank you. Her work is beautiful - very well deserved! Diamonds and Spades and Clubs, Oh My!